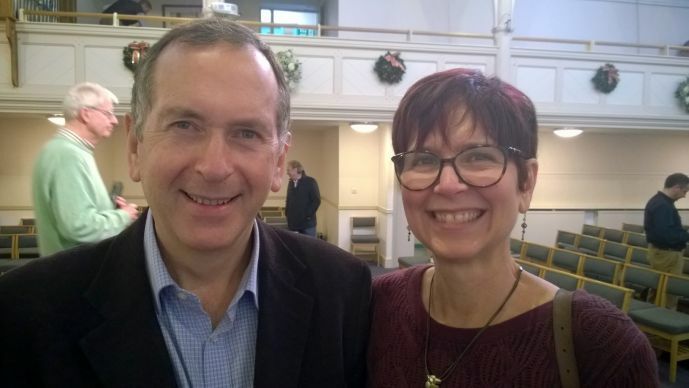 Chris Loughlin and Kathleen LaCamera, who run PictureWise Productions, led the project team for the joint Christmas Eve service of Knutsford Methodist Church in Cheshire, England, and United Methodist Erlöserkirche (Church of the Redeemer) in Bremen, Germany. Two Methodist congregations — one in England and one in Germany — are using the 100thanniversary of the “Christmas Truce” to signal the hope for peace in today’s conflicted world. The Christmas Eve services of Knutsford Methodist Church in Cheshire, England, and the United Methodist Erlöserkirche (Church of the Redeemer) in Bremen, Germany, will include a mutual order of worship, short getting-to-know-you videos, the singing of “Silent Night” in English and German and a late-night Skype connection from Bremen to Knutsford. And, in true Methodist fashion, the churches are exchanging Christmas cakes and cookies. German and British soldiers left trenches along World War I’s western front during the unofficialChristmas Truce to bury the dead, sing songs and hymns, share food and drink and, famously, hold football (soccer) matches. 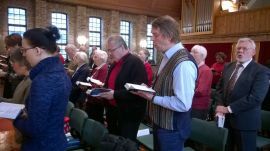 The congregation at the United Methodist Erlöserkirche (Church of the Redeemer) in Bremen, Germany, sings “Silent Night” in preparation for a Christmas Eve connection with Knutsford Methodist Church in Cheshire, England. By Kathleen LaCamera/UMNS. The intense attention in Britain on the 100th anniversary of World War I is evident in Cheshire, where the homes whose family members died in the war are marked with red poppies. The idea for the joint service grew out of a conversation between Cotton and Steven Benson, an ordained Anglican priest who works as a TV producer and regularly attends Knutsford church. For a congregation whose membership includes broadcasting veterans, the Christmas Eve project was a natural, said the Rev. Kathleen LaCamera, a United Methodist chaplain, writer and producer who lives in England and is part of the church. “We’ve all done BBC projects where we link up congregations and televise them worshipping and singing together,” she added. The connection between the congregations is made possible through PictureWise Productions, an independent production company run by LaCamera and her husband, Chris Loughlin, who worked with Benson at BBC Religion. Everyone involved donated their time and expenses. In Bremen, Germany, the Redeemer congregation is thrilled at the opportunity to make this Christmas Eve connection. “In a world of hatred and war, it is a deep sign of hope,” the Rev. Susanne Niessner-Brose told United Methodist News Service. The causes and consequences of World War 1 are being remembered all over Germany, with the city of Bremen alone holding more than 40 lectures, readings, exhibitions and concerts. “Through this process of analyses of the past, it is hoped that the present conflicts can be understood,” she said. “The Christmas message is one about hope and peace, but what can we do as Christians to bring the light of Christ into a world where there is so much pain and inhumanity? I think the Christmas truce story encourages us to put aside the fear and suspicion of things which divide us and actually see and experience how much we have in common (especially as people of faith).” — the Rev. Susanne Niessner-Brose. The Bremen congregation will sing the first verse of “Silent Night” in German, which will be repeated in English by both congregations. The second verse will be sung in German and the final verse in English by the Knutsford congregation and German by the Bremen congregation. In its work with refugees, the United Methodist Erlöserkirche in Bremen has provided shelter for three people from Syria, Iraq and Iran and recently launched the Cafe Tiramisu, which provides cake, German instruction and practical assistance on Friday afternoons to asylum seekers. In Cheshire, others in the community with no connection to Knutsford church, “have been really captivated by the fact that we’re linking live with Germany,” the Rev. Rob Cotton said, citing as an example a local bus driver who wanted to advertise the Christmas Eve service in his vehicle. The rest of the year, the church is well known for its preschool, after-school program, Tuesday senior lunches, adult learning courses, dance school, Bible study groups and other ministries. Started in 1850 by an American German missionary as the first Methodist Episcopal Church in Europe, Redeemer is “a small but very active church” with about 40 in worship on Sundays, the pastor added. Redeemer runs a community program called “The Ark” that hosts various courses and mission events and has played a key role in a refugee integration project sponsored by the city council of Bremen. Some older Germans still have traumatic memories from World War II, particularly the destruction of Dresden at the very end of the war, Niessner-Brose said. An 85-year-old member of Redeemer, Adolf Garde, has recalled many times, she noted, how he wandered through the streets as a young boy and saw innumerous dead bodies, others dying and the city burning. But Niessner-Brose also has visited Coventry, England, where cathedral ruins still stand from a German bombing in 1940 — “a good place to remember the atrocities of war and how reconciliation of nations is one of our greatest challenges as Christians,” she pointed out. “To sing ‘Silent Night’ with British Methodists and see a film about Knutsford on Christmas Eve for sure is a tiny but very creative and touching way of maintaining peace and a way of worshipping that is really extraordinary,” she said. On Christmas Eve, both congregations will follow a similar order of worship, but since the Bremen service occurs in the afternoon, the only live component will happen around midnight, during the Knutsford service. After a video about the Bremen congregation and before the singing of “Silent Night,” Knutsford congregants will watch the two pastors have a brief Skype conversation and exchange the peace. In both services, the pastors will close the worship, via video cooperation, with a final benediction and blessing. Sharon Mayer — a member of Knutsford Church and, until recently, its pastoral worker — has helped Cotton and the congregation with their German pronunciation for verses of “Silent Night” so it is understandable to the Bremen congregation. “We’ve enjoyed trying to get the singing sounding like it’s vaguely German,” she laughed. Mayer’s English father had no siblings, but her German mother was one of five, so “the only relatives we had growing up were our German cousins and aunts and uncles.” Those relatives, she said, gave her a different perspective of World War II from people who were caught up in the conflict but did not choose to be at war. Her own experience of a German Christmas — whether celebrated in England or Germany — was a 4 p.m. service on Christmas Eve, followed by family time around the tree and the opening of presents. Learning of such traditions is a part of the project. Eyewitness accounts of the Christmas Truce mention an exchange of holiday cakes, so the two congregations decided to do the same. “We really want to have the most authentic experience of this connection to the past and to each other,” LaCamera explained. When LaCamera flew to Bremen on Nov. 29 to film a video segment, she carried a traditional English Christmas cake — dense with dried fruit and covered in “royal icing” — with her. The return flight involved the transport of what she estimates to be 500 cookies and a German Christmas cake, baked by the Bremen church for the Knutsford congregation, which she has kept in her freezer and in airtight plastic bags on her back porch. In Britain, Cotton pointed out, Christmas cakes are meant to be cut into pieces and shared together. Being able to “share some tradition and practice” with fellow Methodists in Germany is the significance of the gift, he said.